The glory and pride of South India ‘Kanjeevram’ silk saree is one of the most lavish and expensive traditional sarees of Indian women dressing. Woven with the finest quality silk and pure gold zari, these rich drapes can do wonders to the personality of any woman and bring her into the spotlight of the occasion. Generally, these sarees come in dark bright hues to match the grandeur and ethnicity of the embroidered work. Do not forget to wear matching jewellery and accessories with these heavy Indian sarees and get ready to strut like a diva. How North India can stay behind when it comes to traditional Indian attire?! To level up the saree game with South India, the North Indian states came up with ravishing Banarasi silk sarees which got its name from the Indian city ‘Varanasi’ (earlier known as Banaras). 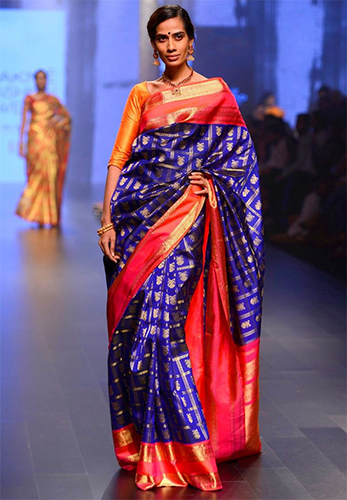 These sarees consist of best silk, rich embroidery and striking hues. Check out online women sarees to discover these plush stapes and start shopping to make your wish come true. If you want to be on the bit lighter side, Chanderi silk sarees are the best option for you. They are also made up of silk but come in light border work and embroidery. The enthralling capacity and ethnicity of these traditional women sarees is simply matchless and forever unbeatable. Buy Chanderi sarees to give your best shot this wedding season. Another one from the group of bright colourful Indian sarees is paithani sarees! Enriched with heavy embroidery and wider border work, these sarees are must have during Indian wedding season. Wear paithani sarees with vintage gold jewellery or kundan jewellery to flare the overall personality and make heads turn around. If you are an art lover, you just can’t say no to kalamkari sarees. These sarees are known for beautiful painting designs and antique patterns over the fabric and look extremely breathtaking. Plus, they are light in weight and extremely comfortable during important occasions. Thanks for sharing. All sarees is really so beautiful.Sarees will be good for all occasions, functions, festivals and etc., These sarees gives us a traditional looks.